There are some pieces of furniture that become too worn to use yet are too sentimental to discard. That was the case with a three tiered wooden table. 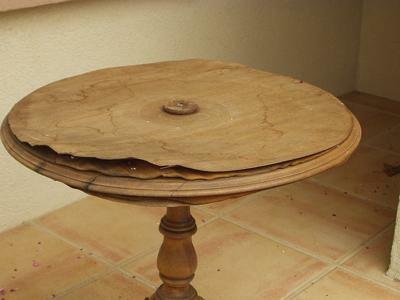 Through the years and moves, the top two tiers became less and less stable and finally snapped off leaving a table with a tattered knob on the middle. It was relegated to the front porch. The veneer began peeling and yet I could not give it up as it had been in the family for at least 75 years! 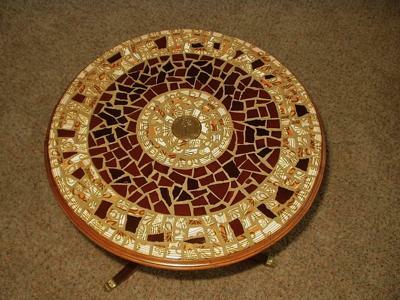 I had never done mosaic work before. While I was researching and making notes for my project, I was also refinishing the legs of the table. 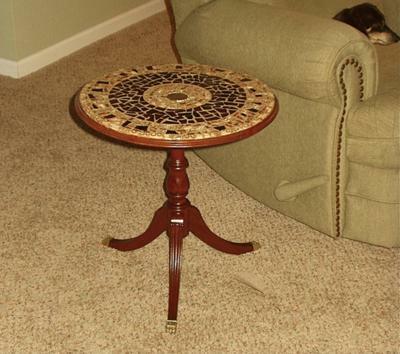 I purchased tesserae from eBay, and through the process I made a new friend in the woman who sold me the pieces. I had some surgery and this was the perfect project during my recovery time. The medallion in the center is a special keepsake of my husband’s. Having it there when the project was finished was a surprise to him! It is not glued in. The table now has a place in my living room once again and gets compliments from visitors.